If you have a Tractor, Motorcycle, Car, Truck, Hit & Miss Engine or any kind of engine that has a magneto in need of repair, please contact me. I have repaired and or restored nearly every kind of magneto that exists. I take cores in trade towards the purchase of rebuilt magnetos or buy them outright and can ship anywhere in the US for $15 - $20 USPS Priority Mail. I also ship Worldwide! Please e-mail for a shipping quote. 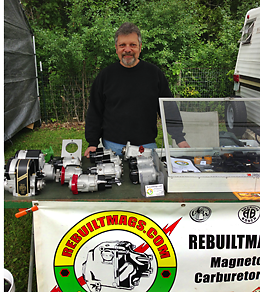 Here we are in the middle of winter and I'm already thinking about the Le Sueur Pioneer Power Swap Meet. This years dates are April 26, 27, & 28 2019. I will be setting up in the same location as in previous years. Please stop by and say hi. If You need something done and want to pick it up at the show, get it in right now and I will have it ready for you to pick up. If there is a magneto or parts you would like me to have for you at the show, please let me know in advance and I will have it for you at the show as well! Thanks and hope the see you there! 2017 © Rudy Calin: All rights reserved.